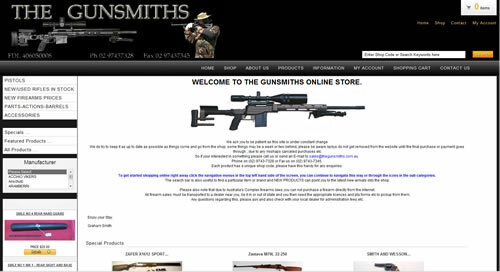 Gunsmiths to the public and trade for over 35 years. New and Used Gun Sales Australia Wide. WE WILL PURCHASE 2ND HAND GUNS ON THE SPOT !! New and used second hand guns, used rifles, used military longarms, used lever action guns, second hand air rifles, used shotguns, used pump actions, used rifle scopes, used target rifles, second hand and new custom rifles, new longarm and pistol sales, reloading gear, safes, tactical accessories, gunsmithing. Our stock is carried in the shop and can be viewed within our normal trading hours Tuesday to Friday.